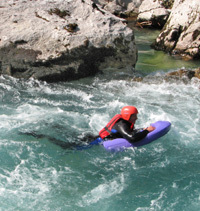 Our adrenalin-packed stag weekends in Austria range from 2 to 4 days with activities including: Whitewater Rafting, Canyoning, Mountain Biking, Glacier Skiing/Boarding, Hydrospeeding and Paragliding - so there is something for everyone. Perfect for Hen & Stag breaks, long weekends or short holidays, we can squeeze in as many activities as you can handle. The itinerary below is just one of our favourites. Please feel free to Contact Us to discuss your ideas and plans. Arrive in Landeck for midday. Time to refresh, change into paddle gear and set off on an adrenalin-packed whitewater rafting run down the Tosens section of the River Inn. Straight into action this morning with Canyoning - one of the most exhilarating activities available. 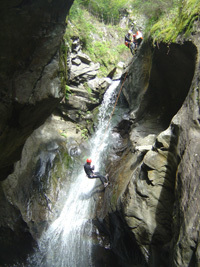 Abseil, swim, climb and jump your way down narrow stream-filled gorges with water pouring past you. In the afternoon, pull on a wetsuit, grab a hydrospeed (rigid body board) and swim down the river over all the rapids back to town. A relaxing evening and well deserved beer will no doubt be on the menu. Morning to relax in the sunshine, and explore the local area. After lunch we grab some mountain bikes and set off to explore the amazing scenery. Trails range from easy low level rides to harder higher level. Or if you fancy a bit of extreme we can partake in some full-on downhill rides with ascents via cable car. We finish today with a hilarious run down the river in Rubber Duckies. With 2 people in each Ducky, these small inflatable dingies will bounce up and down the rapids as you paddle your way down the last big section of the river. Relax in the sunshine with a cold beer before transfer back to Landeck and your departure home. 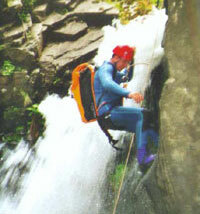 Canyoning: Abseil, swim, climb and jump your way down a narrow stream filled gorge. This is one of the most exhilarating and fun things you can do. Hydrospeeding: Put on a wetsuit and flippers, grab a hydrospeed (like a small rigid body board with handles) and jump in the river! You then swim down the river and straight through all the rapids the river has to throw at you. 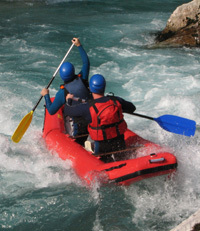 Great fun for those wanting to have whitewater fun aside from kayaking or rafting. Whitewater Rafting: You will have a choice of trips depending on how your group feel, though an adrenalin packed run down the Sanna or the Tosens section of the River Inn have to be two of the best trips to choose from. Mountain Biking: Set off under your own steam to explore some of the amazing scenery that this area of Austria has to offer. Trails range from easy low level rides to harder higher level riding. Klettersteig: High level climb/ rope work in the superb surrounding mountains. Rubber Duckies: These inflatable 2 person canoes are just the best fun! Paddle your way down the river and over the rapids in style. 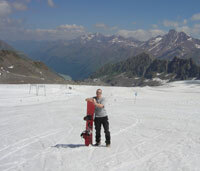 Glacier Skiing/Snowboarding: Superb glacier skiing/boarding  yes in the summer, its madness! Price includes: Half board accommodation, choice of 5 activities*, guides, equipment. Excludes: personal insurance, personal drinks, international flights/transport to Landeck. *Activities include: Whitewater rafting, canyoning, mountain biking, whitewater canoeing (inflatable two-man canoes), hydrospeeding. An additional charge is required for paragliding and glacier skiing/boarding. Please Contact Us for more information.